During the First World War (1914-18), Malta was dubbed as The Nurse of the Mediterranean as it was the largest British military outpost hosting thousands of allied wounded soldiers from the Gallipoli and Salonika warfronts. Numerous convalescent camps were erected and large buildings were transformed into hospitals. Most of these soldiers belonged to the Australian and New Zealand Army Corps (ANZACS), some of whom died while in Malta. In 1915, the Australian Branch of the British Red Cross collected funds for the building of Australia Hall at Pembroke, a recreation centre/theatre and annexes, to stand as a monument to the wounded ANZAC troops that were nursed in Malta. This large hall could cater for some 2000 men, in which stage productions, bingo, dances and other forms of entertainment were held. A library and reading room were later included and it was the building where the Navy, Army and Air Force Institute (NAAFI), was first established in 1921. About this time, a projection room was added for the hall to double as a cinema. 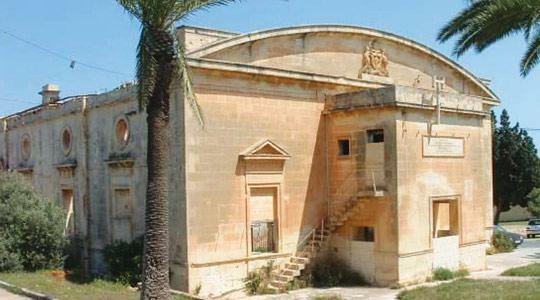 With the closure of the British military facilities in St Andrew's Barracks in 1978, the hall became the property of the Maltese government and later allocated to third parties. Unfortunately, the ceiling of trusses and sheeting was gutted by fire in December 1998 but its sturdy four walls still remain standing and will be subject to a restoration project. In 1996 MEPA scheduled Australia Hall as Grade 2 building of historic, architectural and contextual value as it forms part of a larger scheduled military complex and its protection status was retained and republished following a revision as per Government Notice number 880/09 dated October 30, 2009.